← Events, New Releases, & Closing The Gap! Now Available! New DT Trainer Self-Paced Training Videos! Designed to be BETTER than live webinars! 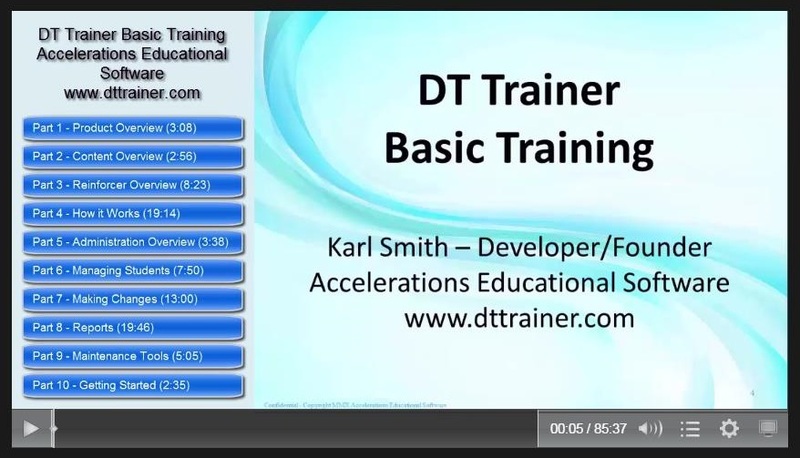 This training covers DT Trainer version 2.6.0.0 and later. The new training videos replace our DT Trainer Basic Training webinars. We will still host DT Trainer private webinars for customers as well as special topics webinars. We will also provide basic Activity Trainer webinars until we have the self-paced training available for that product. The new training videos consist of 10 parts from about 3 to 20 minutes long per module for a total time of less than 1 ½ hours. We go deeper into many areas than we did with live training as we are able to produce a more efficient explanation along with animated graphics. You will also be able to pause, replay, or even speed up the video to accommodate your learning rate. There are “Pause this video and go try it” points with activities facilitating hands on opportunities. This resource helps busy teachers work the training into their busy schedule. Each section gives the video duration, helping the teacher decide when she/he can work in the training. This is an excellent resource for group training with the pause points allowing inclusion of hands on training, group discussion, or collaboration. Administrators can view the complete training to understand the DT Trainer educational resource available to their teachers. Administrators should at least view Part 1 for a product overview, and then skip around sections to get the depth of understanding they need. Support staff should view all the videos to understand the training tool now available to their teachers and point teachers to sections that will aid in the understanding of the program or answer a question. Experienced DT Trainer teachers should view the entire training or skip around to fill in gaps in their knowledge of the DT Trainer. We recommend the “How It Works’, “Making Changes”, “Reports”, and “Maintenance Tools” sections. The reports section has been significantly expanded from previous trainings and includes the newer features, and the pause points and exercises will help teachers get more out of the reports. A solid grasp of the “How It Works” section will help teachers read reports and get more out of the program for a wider range of students. New teachers to the DT Trainer should plan on viewing all the video training. Hands on learners need to do all the pause point exercises. We will be doing further tweaks in the next days and weeks to make further improvements to an already excellent training resource. We have also created a development environment to update the training as we continue to upgrade the DT Trainer. We will create additional training videos for individual product dialogs and special topics that will complement and extend the basic training videos. Look for future announcements! Soon the training videos will be integrated into the DT Trainer as well! Reminder: If you still have old versions of the DT Trainer or Activity Trainer, they will not run on Windows 7 or 8 . Email us for a quote to update old licenses. Email us for a quote if you would like to use the programs in additional self-contained classrooms, developmentally between the ages of 2 and 9.